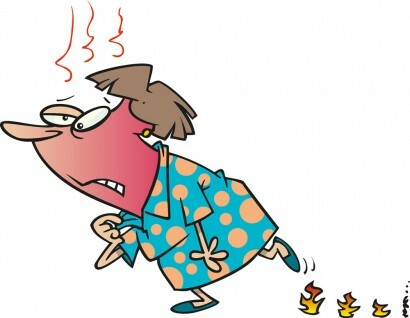 As the weather starts to heat up, it sends us menopausal women into a frenzy and running for the freezer! There’s nothing worse than the feeling of a hot flush coming on especially when it’s accompanied by sweating. Hot flushes are one of the most common symptoms of the menopause and are experienced by 75% of menopausal women. So what do we know about them? They are thought to be caused by fluctuating hormone levels which affect your body’s temperature control. A typical hot flush can last anywhere from 10 seconds to 10 minutes, this varies from woman to woman and flush to flush. They are often described as a ‘creeping sensation’ which starts at the feet and continues to envelope the whole body. They come on suddenly, sometimes without warning, but they can often be attributed to certain triggers. Trigger can be wearing woolly jumpers or polo necks, feeling stressed, drinking caffeine or alcohol, eating certain foods and external heat sources like a hot bath or that lovely sunshine we’ve all been waiting for. Turn the heating down – if it’s still on! Or open the windows and get some air circulating. Dress in layers – then you can take some off when you feel a flush coming. Eat sage – use it in your food or use a tincture or use the leaves to make a tea as it helps reduce excess sweating. Avoid spicy foods, refined sugar and alcohol as they are all trigger foods. Avoid hot places, having hot baths, saunas and spending too much time in the sun. There are so many benefits to cleansing your system during the menopause, it will help reduce the symptoms including hot flushes and sweats, reduce bloating and help you feel energised. If you’re interested in joining my next group contact me now. Posted on 19th April 2018.